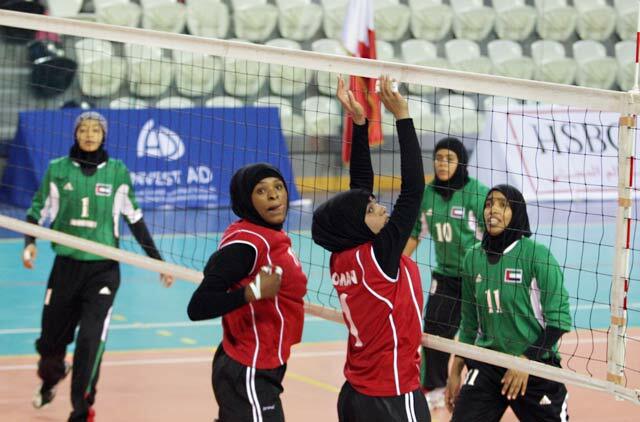 Abu Dhabi: The UAE team look set to defend the volleyball title they won in the first GCC Women's Games in Kuwait two years ago as they trounced Oman 2-0 at the Al Jazira Indoor Stadium on Wednesday. The UAE dominated the match, winning 25-10, 25-9, with good striking, solid defending and accurate service. The team was represented by Fatima Hassan, the captain, Alya Nasir, Abrar Ali, Nadia Ali, Samiha Hassan, Fatima Mohammad, Rawiya Mubarak, Muna Abbass, Sana'a Aref, Kolaithim Rahma and Muna Haider. In the first match of the opening day, Kuwait beat Bahrain 2-1 (22-25, 28-26, 25-18) in an encounter that lasted more than 90 minutes. In the final day of competition, Oman will face Kuwait while Bahrain will play against the UAE. Meanwhile, Haya Sameer added another gold medal to the UAE haul after winning the 53kg taekwondo competition in the GCC Women's Games held under the patronage of Her Highness Shaikha Fatima Bint Mubarak, Chairwoman of the General Women's Union and patron of the Games. Haya was followed by Kothom Mubarak from Qatar who won the silver, while Zuwaina Abdullah from Oman and Noura Adil from Bahrain shared the bronze. "I dedicate this victory and the gold medal to Shaikha Fatima and to Shaikha Maytha Bint Mohammad Bin Rashid Al Maktoum for their unlimited and continuous support. "I was confident of winning the gold medal because we are well prepared for the competition in addition to the fact that the presence and support of Shaikha Maytha was a motive to all of the UAE players to excel and do their best in the competitions. "I believe such competitions will encourage more women to practice the game and will lead to its spread and improvement in the region." Dina Eid Mahbout from Bahrain won the gold medal in the 46kg category, with the UAE's Al Ghaliya Askar winning the silver and Aisha Salem from Qatar taking the bronze. 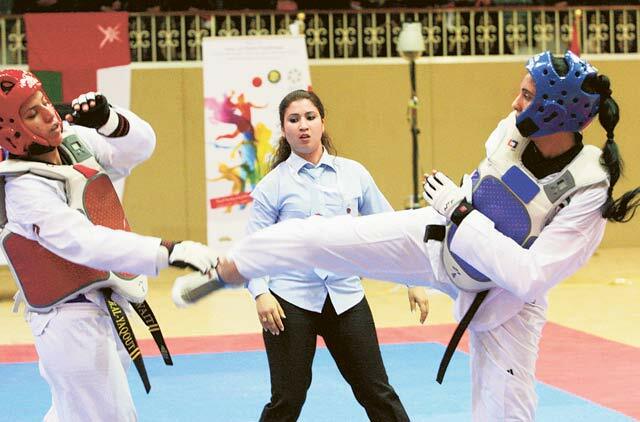 Dina Al Mansouri from Qatar won the 62kg category leaving the silver to Anood Al Malkawy from Kuwait and the bronze went to Muneera Al Ka'abi from the UAE. Sameer Juma, the coach of the UAE team, said: "I am happy with this performance because it is the first participation for our players in the taekwondo competitions."